HE’S modest, unassuming and on the face of things a thoroughly unremarkable person. He and his wife run a small Midlands business employing up to four other people. 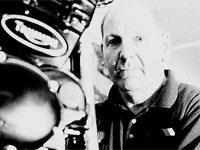 Yet John Wilcox is one of the most important men in the British motorcycle industry. Millionaire Triumph boss John Bloor excepted, he is probably the man with the biggest influence over the development of the British factory’s engines. When Wilcox talks, Bloor listens, because he knows if his engines aren’t at the very cutting edge of his customers’ expectations in terms of power, rideability and reliability, the bikes they’re destined to be installed in will simply never sell. And no Triumph will come under more scrutiny in this respect than the all-new TT600. That is the bike that Wilcox, who has been a consultant to the British firm since it started making bikes at Hinckley in 1990, has spent the last two years of his life working on. The 600cc market is arguably more competitive than any other. Bikes like Yamaha’s R6, Honda’s CBR600 and Kawasaki’s ZX-6R are almost on a par with superbikes and offer a brilliant package of light weight and heaps of power. Triumph knew from the beginning of the TT600 project that it needed a world class engine. That’s why it decided to turn its back on modular designs which can be used in a number of bikes. Instead, it launched a no-compromise bid to make the best 600 engine around. So you may be surprised to learn that the engine wasn’t developed in-house at Triumph’s Hinckley plant. The firm’s R&D team of around 70 people designed and built the first prototypes, but when the basic specification was agreed upon, those motors were then taken over the road to Wilcox and his team, where they were gradually developed and refined to exacting standards, just like every other Triumph engine for the last 10 years. The only time the engines go back to the factory is when Triumph wants one for a test run in a chassis. Wilcox, 50, explains: " We’ve often lifted a red hot engine off the test bench with asbestos gloves and trolleyed it across the road, still steaming. " Wilcox started building, developing and testing race engines for cars back in 1976, specialising in Cosworth BD series engines for rallying. He quickly built a reputation in all forms of motorsport including circuits, hill climbs and sprints. Over the years Wilcox Engineering has worked on touring car teams’ engines too, including Ford, BMW and Peugeot. A pretty impressive pedigree. But it wasn’t until he fitted fuel injection to a Moto Guzzi engine that he approached Triumph about doing some work for them. Triumph was impressed and Wilcox was taken on as a consultant. Bloor even helped out financially with Wilcox’s premises when he moved nearer to the factory, including forking out to help buy a £100,000 engine test bench. And Wilcox’s professionalism is apparent from his immaculate workshops. Talk about a place for everything and everything in its place. He may have made his name in cars and doesn’t even ride bikes, but Wilcox has appreciated motorcycle engines for years. He said: " Family car engines are so industrial compared to street bikes which are light, sleek and well machined. You can really appreciate them. Our lads just got bored working on standard car engines. " The first engine Wilcox worked on was a Trophy 1200 and as the firm expanded, work became more steady. Wilcox said: " I would never have thought in the beginning that Triumph could have become so big, so soon. " Wilcox’s work involves a process of elimination that would try the patience of a saint. There’s an almost infinite variety of combinations which have to be tried and re-tried to maximise the performance, reliability and efficiency. Triumph specifies power and torque targets and Wilcox has to hit them. That means trying all sorts of exhaust lengths, making different camshafts, trying various inlet lengths, airbox specs and cam timings. With tens of thousands of variables involved, Wilcox admits that you’ll never build a perfect engine, it always has to be a compromise. And emission laws also hamper his work. He said: " If Triumph wants an engine to produce 80bhp, we have to find more because we’ll lose some once the exhaust system is fitted. We have exhausts which break down into small sections so we can try all different lengths.
" Dataloggers gather all the information from our engines on the test bed – just like on-board telemetry records everything a GP racer’s bike does on the track – and from that we can produce projected power curves to see if we’re going in the right direction. " Sometimes that direction can be nowhere and Wilcox and his crew will have to start all over again. But as he says, it’s never a waste of time because you learn not to go that way again. Wilcox has to work within strict parameters set by Triumph, which he admits is a good discipline. " If Wilcox Engineering built a bike, no-one would ever afford it because I’d make every part the best and most expensive there is! " he said. " We’re not interested in cost, just performance. " But, modest as ever, Wilcox adds: " Developing an engine is just a plodding process of hard work - it isn’t rocket science. " Triumph knew performance was everything when it decided to enter the 600cc market, which is why a four-cylinder engine was chosen over the firm’s trademark triples. Triumph marketing chief Bruno Tagliaferri said: " We concluded at an early stage that a triple wouldn’t make enough power. The general feeling was that if the performance wasn’t there we might as well forget it. " Given the quality and popularity of the opposition, a new British machine entering the market could not afford to give away any ground if it was to have a chance of persuading customers to change. Triumph doesn’t expect anyone to trade down from a superbike, making the market even tougher to crack. That’s why the firm invested an estimated £3 million in developing the engine. But while that may sound like a staggering figure, it’s peanuts compared to what car manufacturers spend. Wilcox says his job is made tougher because he’s only given a handful of engines to work on, while car makers may be given hundreds of units to destroy at their leisure. But once Wilcox gets his hands on an engine – which is usually two years before punters even get to hear about it – he really goes to work. The TT600 motor was run flat-out in top gear on the test bench for more than 60 hours! It’s crucial to allow for abuse by unsympathetic owners, so Wilcox has to be fairly brutal. He says: " It makes me cringe when I see riders taking off on a cold engine and thrashing it straight away. Some of them don’t have any idea what’s going on inside. " Wilcox reckons German riders are the worst offenders, saying it’s part of the " macho " culture for them to rev their bikes hard from a standstill. If you’ve ever been to the Isle of Man TT you’ll know what he’s talking about. To take account of this behaviour, Wilcox will run an engine flat-out just 30 seconds after it’s been started. Then all tolerances will be checked to make sure the engine isn’t about to seize. All the pistons and barrels are continually checked, replaced and thrashed again and again to simulate every condition they might go through. But even though he has to test engines to extremes, Wilcox claims he’s not so violent that he blows them up like some other testers have been known to do. Car makers have been known to get through up to 2000 prototype motors. Tagliaferri claims Triumph has spent more time working on the TT600 engine than on any other the firm has ever built. And that includes checking out the competition. Like all bike manufacturers, Triumph gets hold of its rivals’ engines to see what it has to beat. But bhp isn’t everything – rideability and driveability are equally important. Tagliaferri says: " There’s no point in having a huge bhp figure if it only comes in a peak. The bike must be useable all-round and that’s what we’ve achieved with the TT600. " Wilcox claims the four was harder to work on than the triples he’s been so used to. He says it’s far more challenging to get extra power-per-litre out of a small and light engine than bikes like the 955i. But if it’s pure horsepower that Triumph wants, Wilcox will find a way to deliver it. Like when the firm wanted to test the T595 chassis, but didn’t have an engine. No problem. Wilcox simply supercharged a T509 engine to pump out a whopping 130bhp. But that’s puny when you consider he has squeezed 280bhp out of a Trophy 1200 engine for a race car. The injected engine was supercharged and ran on methanol fuel. Concerns over throttle response prevent Wilcox from making mad engines like that for bikes. As he says, a throttle can’t be too responsive or we’d all be flipping ourselves off the back of our bikes with painful regularity. And since Wilcox doesn’t ride a bike, he works closely with Triumph’s engineers to find the correct balance of power and rideability. With the TT600 completed, Wilcox is already working on new bikes for Triumph which are two years away from completion, but he’s staying tight-lipped on details. It was down to Tagliaferri to offer a tantalising glimpse into the firm’s future. He said: " We want to offer more diversity than any other bike manufacturer by having a wide variety of engine configurations. Triumph will continue with triples as our hallmark, but we now have a four and we want to have twins, too. "